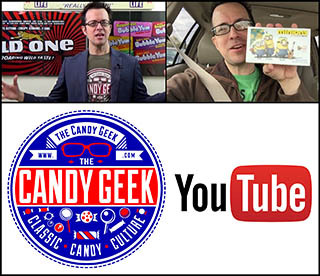 When I set out to launch CollectingCandy.com, my mission was clear: celebrate the history of candy packaging, its marketing, and the people behind it. Sure, the title was Collecting Candy, but I felt that you didn’t need to be a collector to enjoy these stories, and to appreciate this history. After all, candy is a part of most of our lives, in one form or another. 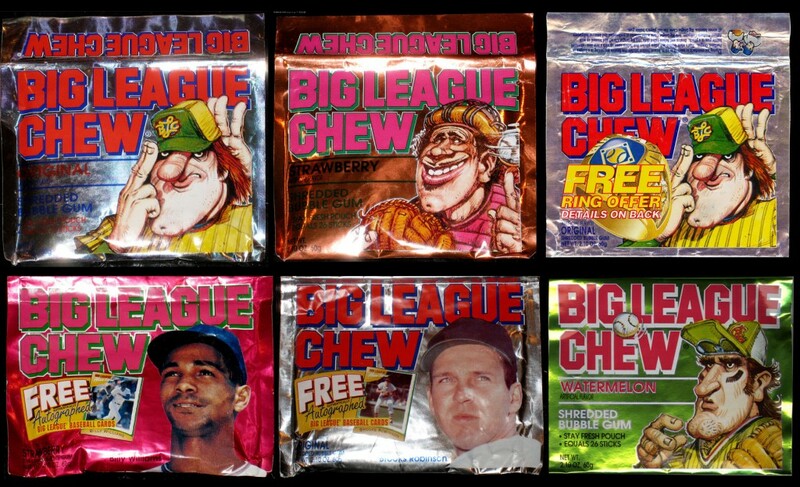 Not long ago, I began building a collection of vintage Big League Chew pouch bubble gum packets. 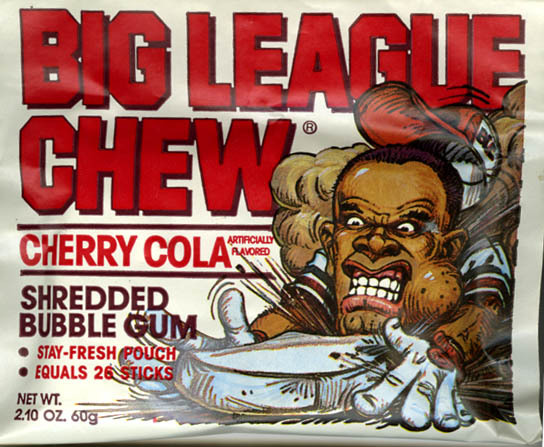 My curiosity about the brand soon revealed that the two men credited with the birth of Big League Chew were still around; Rob Nelson and Jim Bouton. 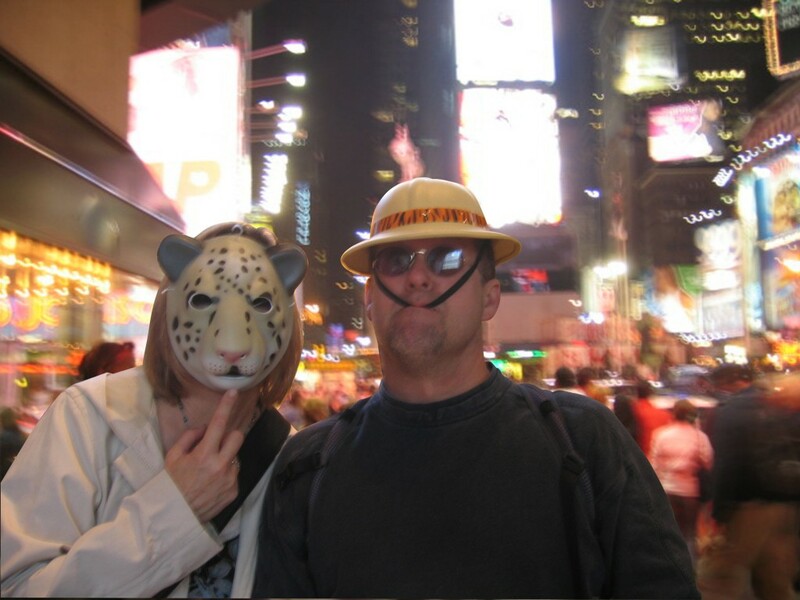 A bit of internet digging and a few e-mails later, and I was in touch with Rob “Nellie” Nelson. 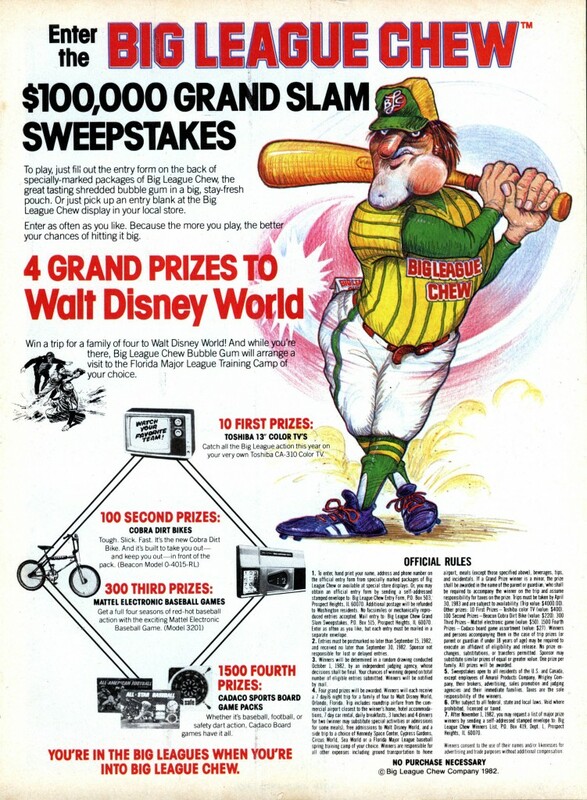 Nellie was an enthusiastic source of information, and he put me in contact with his longtime Big League Chew partner (and former Yankee great), Jim Bouton, as well as the artist who created the amazing mascots that are so fondly recalled when we think of Big League Chew, Bill Mayer. I interviewed each of those three gentlemen, and a few others involved with Big League Chew. What follows is the heart of those interviews, along with a wonderful gallery of rarely-seen pieces of Big League Chew packaging, and a few other tasty tidbits. The launch date of this site is also related to feature we chose. February 6th, 1979 was the day Rob Nelson cooked up his very first batch of home made bubble gum, and turned it into shreds using a pizza knife. 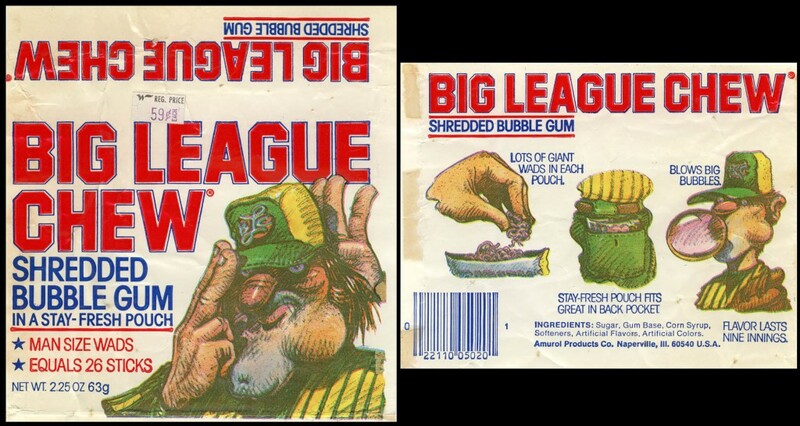 So, today marks the anniversary of the birth of that very first batch of shredded gum, the earliest version of Big League Chew. In keeping with the baseball theme, February 6th is also Babe Ruth’s birthday. So happy birthday Babe, and happy birthday, Big League Chew. 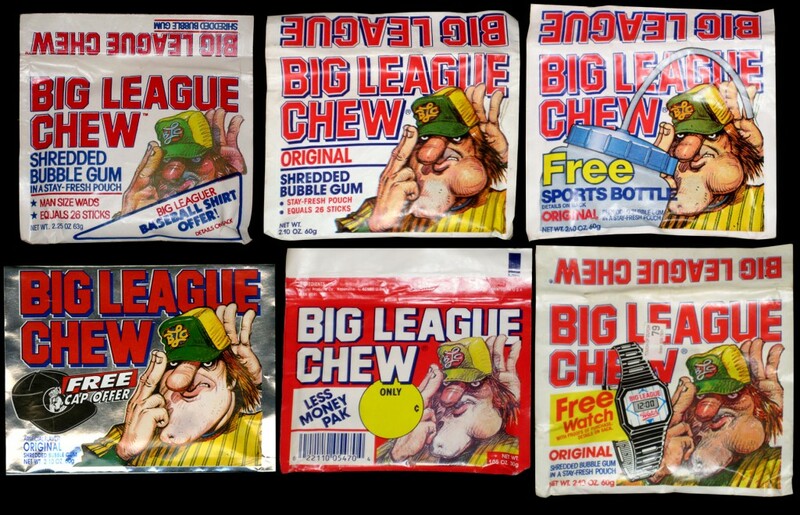 A front-and-back panel from an original 1980 Big League Chew pouch. “Sitting in a bullpen one night, Portland Maverick’s left-hander Rob Nelson, and teammate Jim Bouton, the former New York Yankee All-Star, wanted something really different and fun to chew. 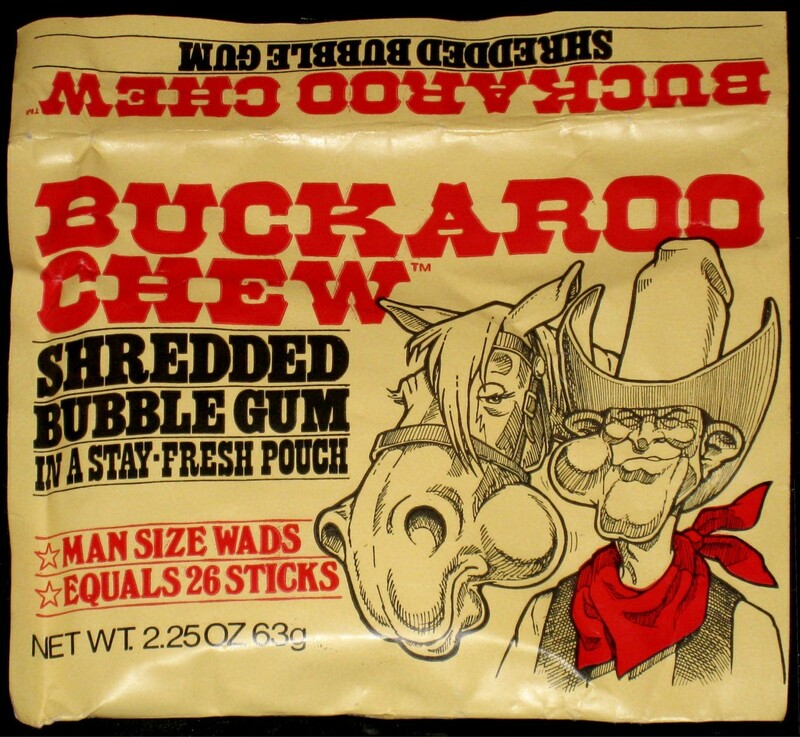 So they came up with a great idea – shredded bubble gum in a pouch – and called it Big League Chew. It soon became an amazing hit with ballplayers everywhere. That’s the highlight-reel version of the colorful origins of Big League Chew that I’ll be expanding upon here. Bouton was intrigued with Nelson’s idea, and he asked what it might be called. Nelson offered, “I’ve got a few names — Big League Chew is my favorite.” Bouton liked what he heard. 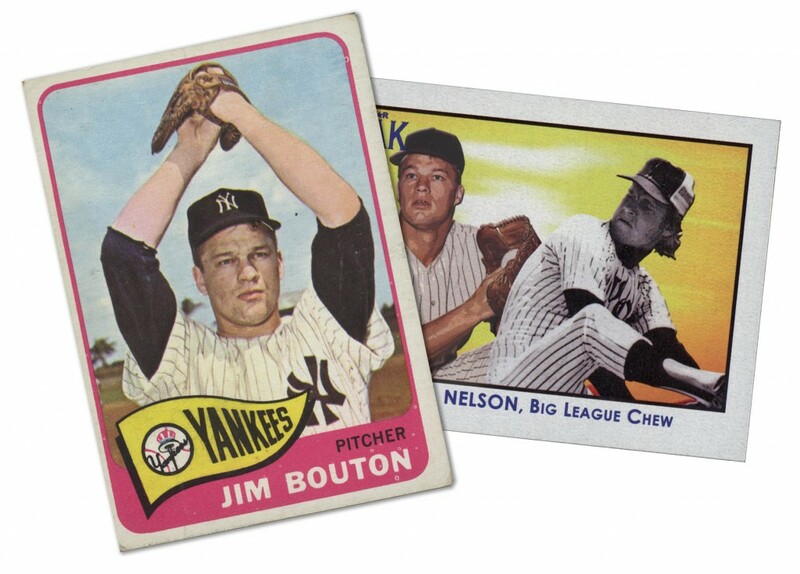 Jim Bouton and Rob Nelson - Big League Chew creators in baseball card form. When I asked if he had any trepidation, risking so much on a venture and business he had no experience with, Bouton explained that he had always had an entrepreneurial spirit. When he heard Nelson’s idea for Big League Chew, he realized it was the kind of idea that he could help make into something big. Bouton had been figuring out ways to create success for himself and others, all his life. Bouton knew opportunity when he saw it, and he believed Big League Chew was something. 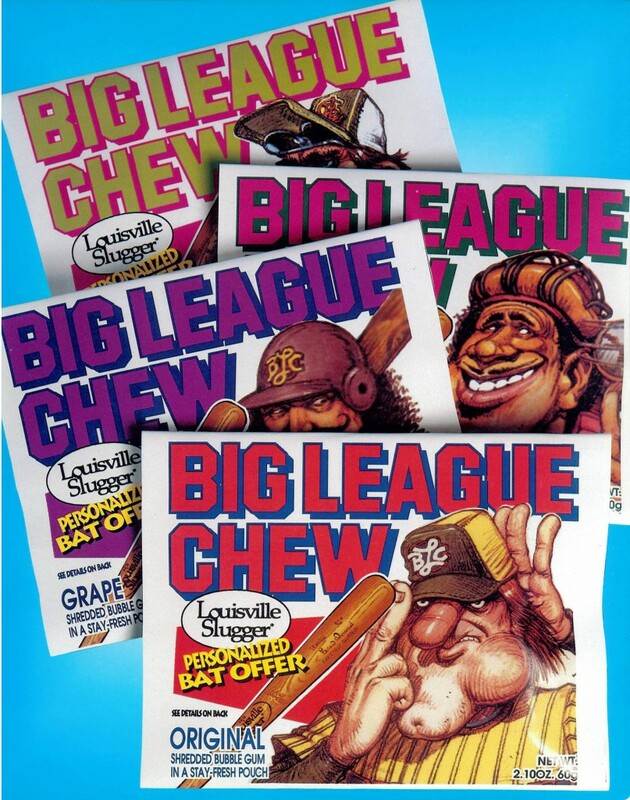 Bouton’s conversation with Rob that day in 1977 was the beginning of a business partnership that would eventually bring Big League Chew to life, but it wasn’t quick, and it wasn’t easy. As Rob recalled, in January of 1979 he found a homemade bubble gum kit from an article in People magazine, and he “ordered a bunch, from a company out of Arlington, Texas.” He baked those first batches of bubble gum in the kitchen of the Maverick’s bat boy, Todd Field. [Trivia: Todd is now a renowned Hollywood film director.] From there, he cut up the gum with a pizza knife, and then mocked up a package to see how a rough prototype might look, so they would have something to show. For those early samples, they emptied out foil tobacco pouches, and the gum went in – creating what was probably the very first pouches of shredded bubble gum. After working out how their product might look, it was time to find a company that could bring it to market. The whole town smelled like bubble gum for years. Jim Bouton had the connections, and the knowledge of how to protect their young idea. From there it would be a two year process before Big League Chew would find a company that believed in it. 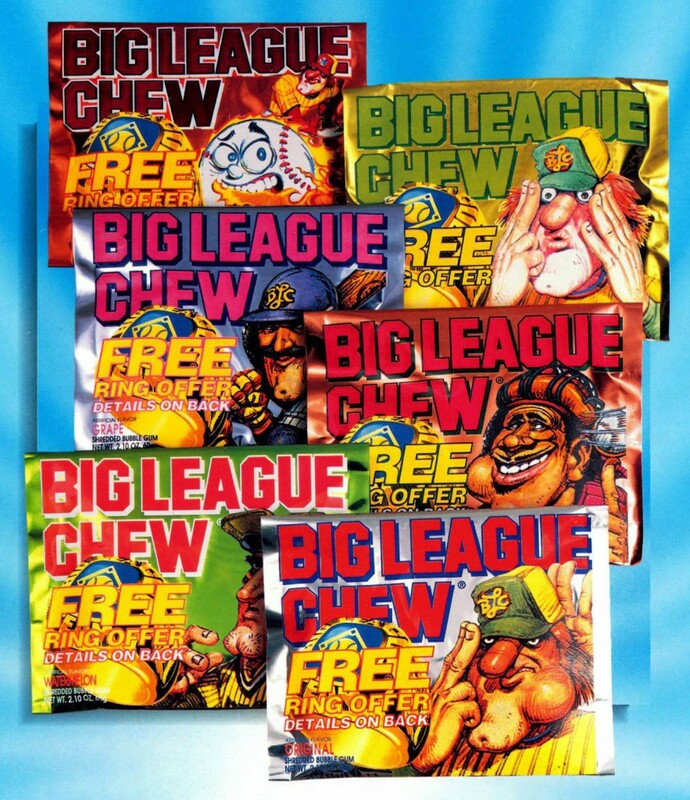 Bouton and Nelson took their Big League Chew idea to Topps, Fleer, Leaf, Lifesavers, and American Chicle. Each time they received a similar response, “It’s interesting, but we don’t make anything like that.” After a good deal of rejection, they found Amurol. Amurol had been a bubble gum and confection company specializing in sugar-free items. Wrigley purchased Amurol for that specialization in sugar-free, but when the market for sugarless products ebbed, they didn’t quite know what to do with their acquisition, so they set Amurol to work on novelty bubble gum. It turned out that a fellow at Amurol had figured out how to shred gum six years before, but they hadn’t come up with any way to market it. Amurol was delighted when Bouton and Nelson came along with a name and concept, and they soon struck up a licensing deal for Big League Chew. With Rob Nelson’s invention, and Jim Bouton’s entrepreneurial drive, Big League Chew found a home with Amurol/Wrigley. 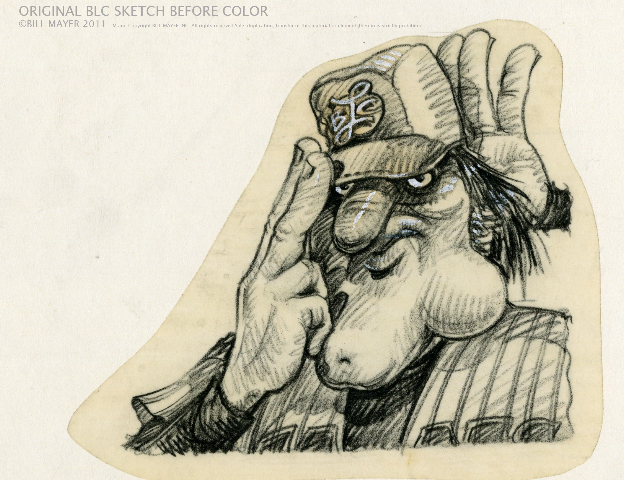 Original Big League Chew mascot pencil rough courtesy Bill Mayer. Assorted "Original" packs. From the 80's through the 90's. Every promotion had to be approved and inevitably, they were tied to sports, or to the brand itself. 1994's Free Ring promotion ad. Courtesy of Wrigley. Shredded Pouch Bubble Gum without peer. On the topic of other shredded gums, it seems that everyone agreed, finally, that Big League Chew was the magic formula, and that nothing else quite “got it”. But it wasn’t for lack of Amurol, and others, trying. Bouton recalled a “racing car chew”. 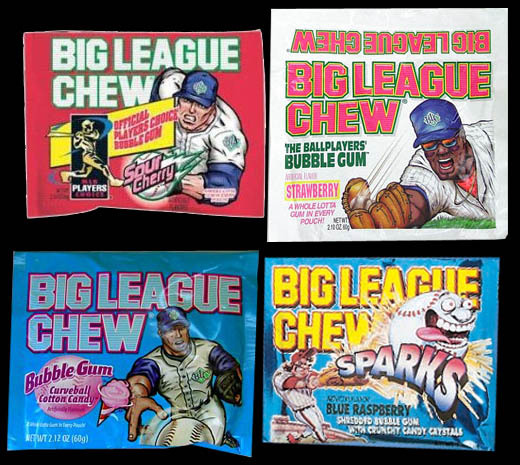 But nothing could ever grab kids like Big League Chew. 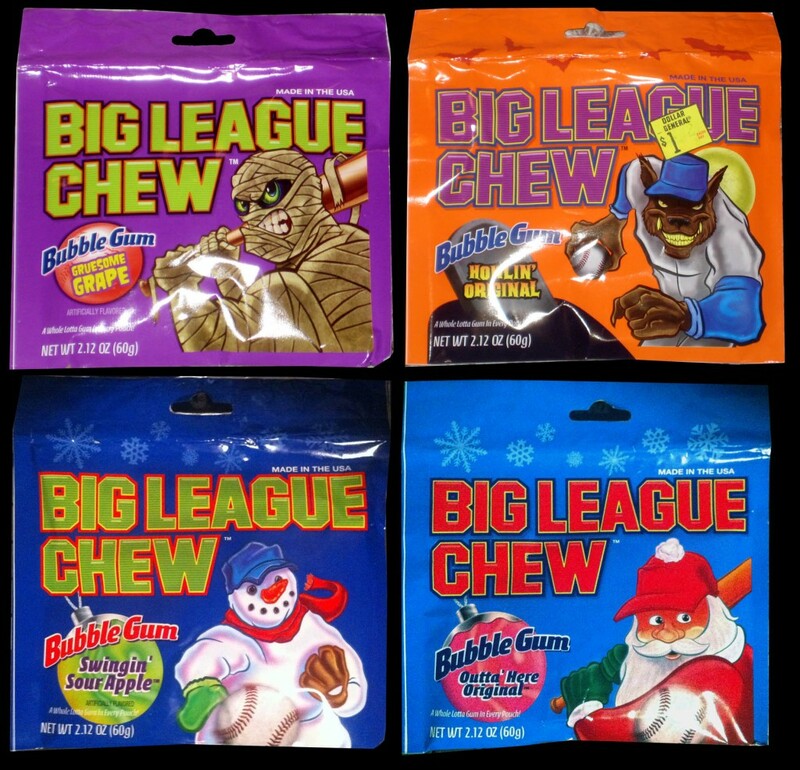 As the 1980’s progressed, Big League Chew became a candy isle staple – kids loved it, and pouch bubble gum became a significant new confectionery niche. Eventually the fad would die down, but Big League Chew would remain – it had that magical combination. Big League Plug sales sheet. Image courtesy Wrigley. Rob explained that he felt you should “Stick to who brought you to the dance.” So while some brands would typically cross over into other genres of confection, Big League Chew stuck to shredded bubble gum sold in a pouch – it was what proved to be as close to a sure thing as you could get. But even within that description, there were some flavor extensions and experiments that were tried. While other sports were brought in, baseball remained the focus. A few other discontinued flavors. 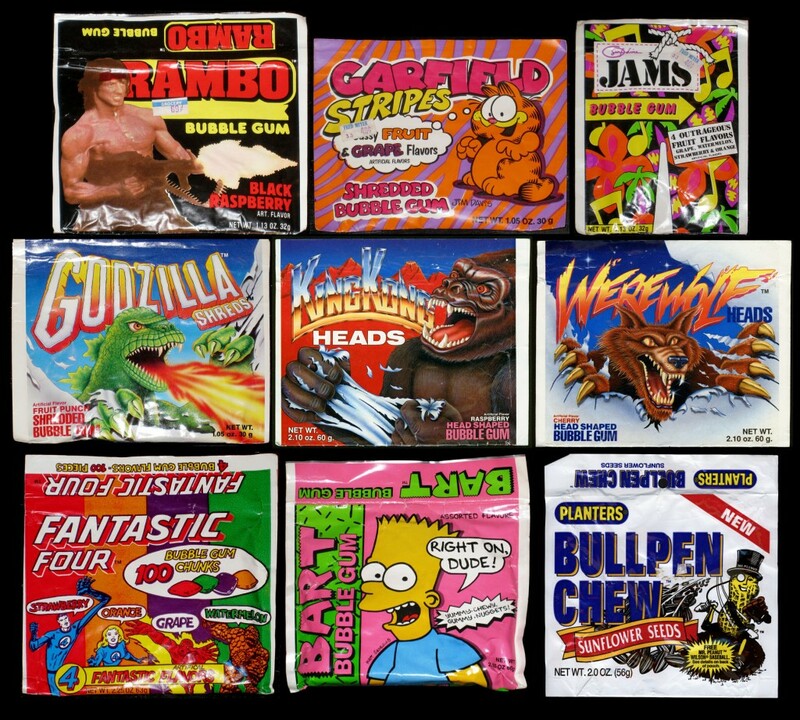 By the 1990’s, the Bill Mayer illustrated pouches had been around for what was considered a long time in the candy business and “they needed updating.” The characters became more slick, the packaging was changed to foil, and for a time, real-life Hall-of-Famers replaced the pouches’ hallmark illustrated characters. 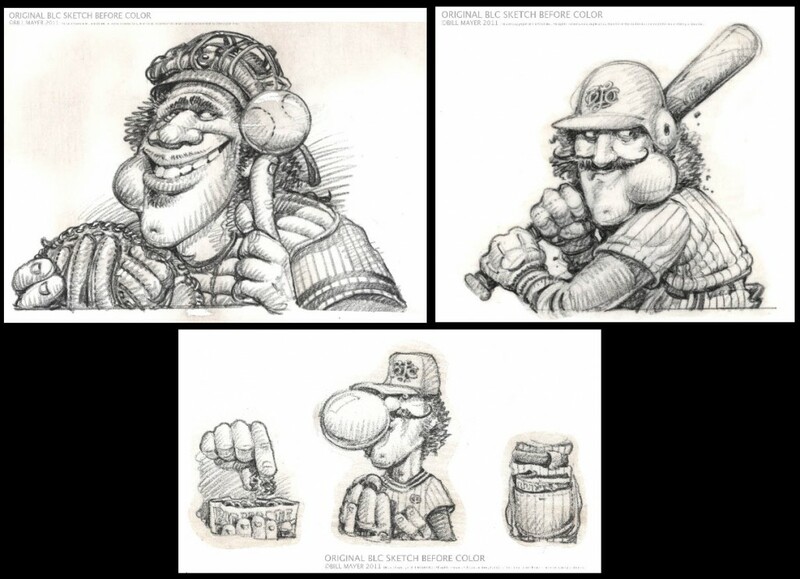 Gary Rose, a senior designer at Wrigley during the 1990’s and 2000’s, was tasked with helping give Big League Chew a new look. The flavor and package assortment as it was in late 2010. Unfortunately, Gary has not turned up that piece of artwork yet. But if he does, we’ll report it here. Mike and Mike Big League Chew package graphics - Early 2000's. Image courtesy Wrigley. About a decade ago, Rob Nelson bought out Jim Bouton’s stake in Big League Chew, yet they still share the trademark. 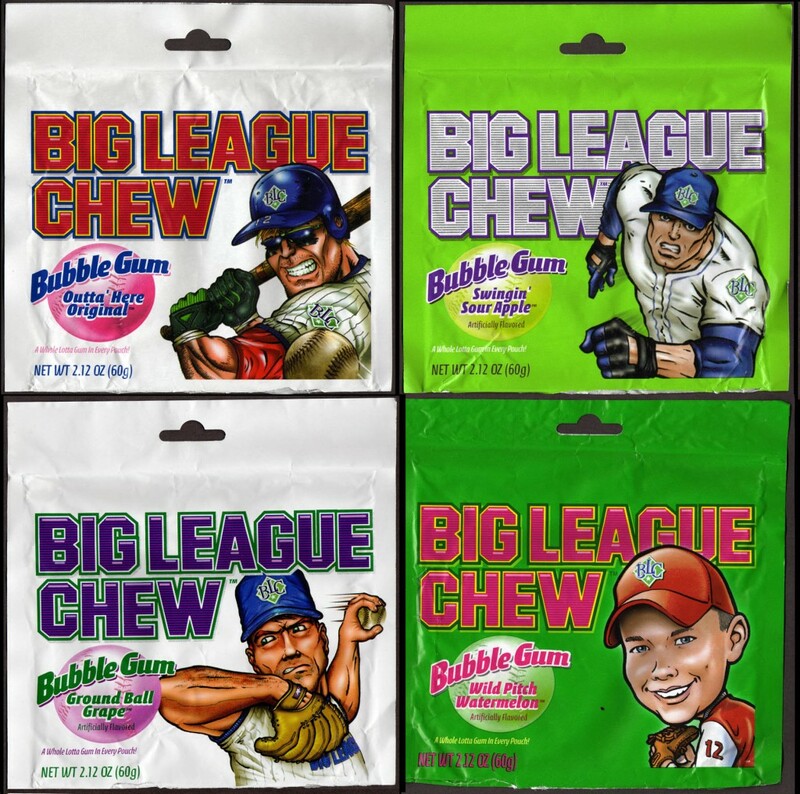 Bouton retains rights to the “Big League” brand and characters for licensing out to other products, while Nelson hold all the rights to the brand’s bubble gum side. The division, I am told, was organic and friendly. At the end of 2010, another dramatic change occurred, when Wrigley gave up the Big League Chew license, leaving Nelson to pursue an agreement with Ford Gum to be the gum’s new producer and distributor. I asked Nelson about the transition. Nelson recognizes a behind-the-scenes player who had so much to do with helping Big League Chew and it’s continued success, Bob Anderson. “Bob is the guy who got things done later on. 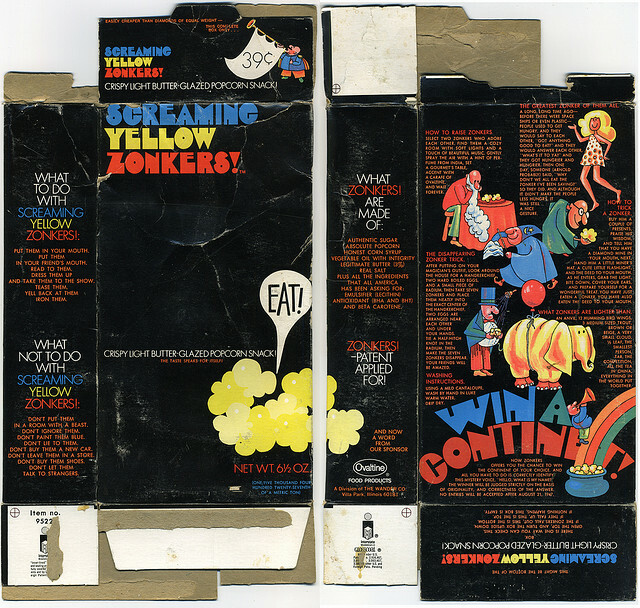 He was the Colonel Tom Parker of this thing.” Bob Anderson also had a hand in the birth of Willy Wonka’s Nerds candy, but that’s a story for another time. Just over a year ago, Ford Gum took over Big League Chew. Bringing production back to the United States, they’ve already made moves to delight collectors like myself, releasing limited-edition holiday packaging. It’s a bold, exciting time for the Big League Chew, and CollectingCandy.com will be enjoying all that future of the brand has to offer. 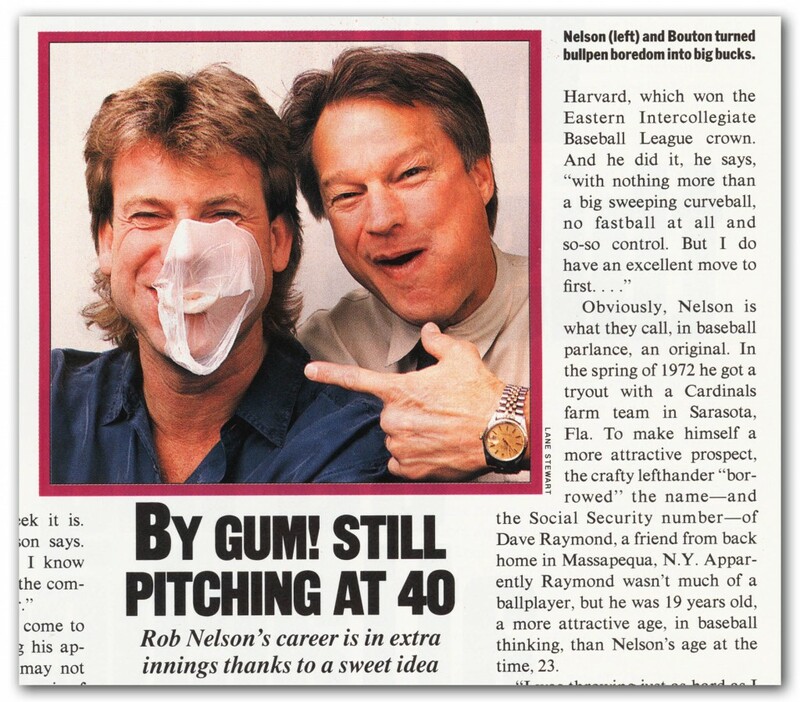 Special Thanks to Big League Chew creator Rob Nelson, who was so much help in bringing this feature together. Also thanks to Jim Bouton and Bill Mayer, for sharing their perspective of how Big League Chew first came to be. Also thanks to: Rocco Pawlowski and Bob Anderson of Wrigley, David Plotnick of Ford Gum, Gary Rose for providing images I couldn’t find anywhere else. Todd Franklin of NeatoCoolville.com for his “ring offer” pouch scans, and finally to Dan Goodsell for kicking off my Big League Chew collection, and all my fellow collectors and candy enthusiasts, for constant inspiration. 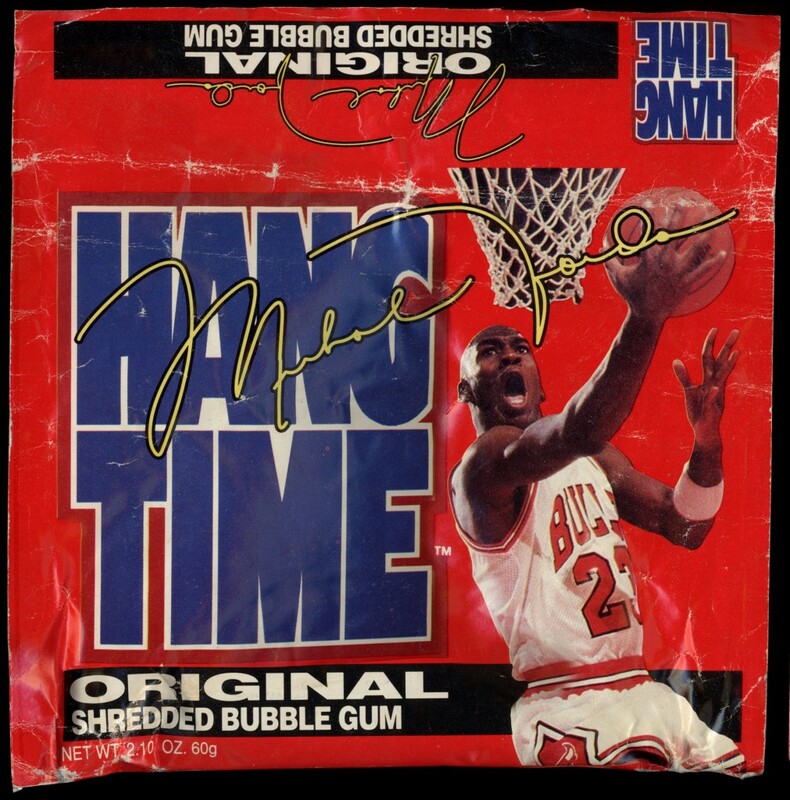 This entry was posted in 1980's, Bubble Gum, Gum and tagged 1980's, 1990's, 80's, 90's, baseball, bubble gum, bubblegum, candy, gum, history, mascot, packaging, retro, shredded, sweets, vintage, Wrigley. Bookmark the permalink. This such a thoughtful and comprehensive post on BLC history. Very well done! Congratulations on launching the new site. With your passion and knowledge, there’s no doubt that this site will become an authoritative resource on candy matters. this is a great, in depth awesome resource, I am glad I found it! Amazing! 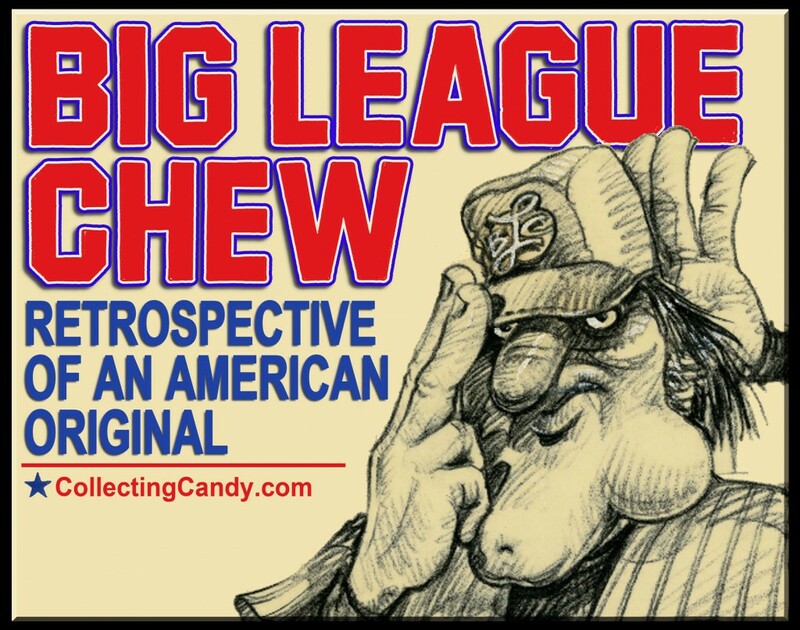 Such a great post on the history of Big League Chew. Thanks for putting this together and congrats on the new site! This is amazing!! I can’t believe it. I can’t believe it. Thank you so much Jason!!! What a resource!! Your pictures and layout are beautiful and bring class to our hobby. You’re my hero!!! Brilliant! This is what the internet is made for. Thank YOU for taking the time to amass and share such an amazing story. I’m going to buy some Big League Chew tonight at the corner store here in Key West—I see it all the time but being an “adult” it hadn’t registered for decades! 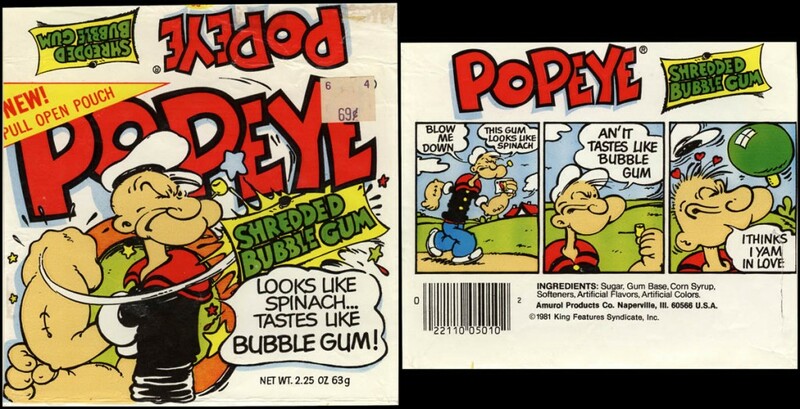 I remember stuffing my face with Big League Chew on many an occasion when I was a kid, but I recall loving the Popeye ‘spinach’ gum in particular since I was (and still am) more of a cartoon geek and not much of a baseball fan. Way to go with the great new site Jason! Looking forward to checkin’ back here often. Holy Crap Jason! So glad to see you put this site together. I would love a retrospective my favorite long-lost candy: WACKY WAFERS. Glad I dropped by the Flickr site today — the new site’s a terrific idea! Just shared on Facebook and Twitter. Bookmarked! I came across this via Neatorama. I had to pause and think to try to remember when I used to chew this stuff myself. Chances are I was chewing this in the summer of 1980, just when it was introduced. If I remember better, I seem to recall that it was actually one of the more tasty gums available. Amazing and thorough story; I loved it. I remember enjoying BLC as a kid and coincidently “Ball Four” by Jim Bouton is the first real book I remember reading. A fantastic piece. First time visitor to the site. Thanks for putting in the time and effort and professionalism. Big League Chew really is an American staple. I’m surprised to hear Wrigley let the brand slide home elsewhere. In my opinion, this is a candy and gum that actually transcended “junk food” and got kids thinking about illustration and sports in new ways. I remember seeing the gum in stores as a kid and it’d actually pump me up for little league games and practice. Something about the gum as a burst of energy, an endless source of kapow when I was out in left field awaiting a pop fly. 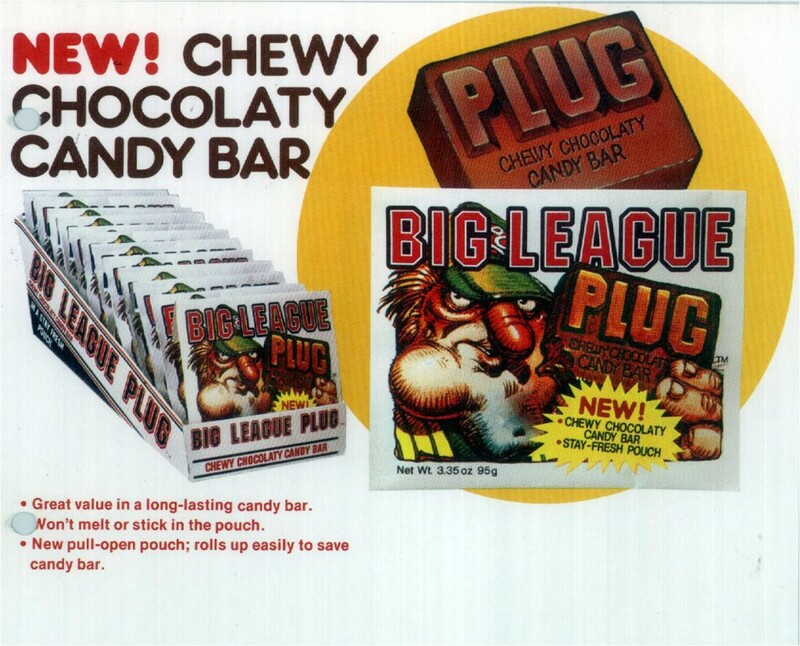 And unlike candy cigarettes, which were popular at the time, Big League Chew seemed to work against dipping and tobacco more than it played into romanticizing it. Major League’rs used BLC. And coaches and parents. There was a freedom, “responsibility” is probably a stretch, in choosing how big a wad you picked from the pouch. You owned that pouch. I think that a lot of gum’s charm has to do with Mayer’s art. The article did a great job expressing that and getting Mayer’s viewpoint. I’d like to hear about Mayer’s influences in art and comedy at the time he created the sausage-nosed character. The character had a somewhat dark, daunting demeanor–an obsessive commitment to the game in the beady eyes and that no-nonsense expression. Something about it reminded me of the charm of EC Horror Comics. The art and packaging really separated BLC from the rest, separated the men from the boys. I’d imagine BLC skewed male in total sales more than most candy and gum. It probably didn’t translate to basketball and hockey because all of the motion involved in those sports. Baseball is more about patience and being outdoors. Anyhow, thanks to the author and to the creators for sharing this history. I know many of us get a smile on our face thinking about their product. Like baseball, it reminds us of a simple, populist time and the best parts of America, with a little entrepreneurial hustle to boot. Hey, Jason, this site is off to a great start. You did such a thorough and entertaining study of this subject, which has been somewhat ignored over the years. Looking forward to seeing what you and your site have in store. Thanks for this story. It brought back some great childhood memories! I can attest to the sweet smell of bubble gum growing up in Naperville. In grade school we would participate in products sampling. Anyone remember bubble paste? congrats on the new site, its awesome! and i loved this BLC article, makes me want to run to the store and chew up a whole pack! Nice job on the Big League Chew story. I always loved it when I was a kid. Might have to pick up some. Look forward to more stories! Website is terrific. The story on Big League Chew is amazing. Thanks for the history. Look forward to more. I won one of the promotional t-shirts. I wish I still had it. It was the first and only thing that I ever won. I spent the rest of that summer entering any and every contest sweepstake I could find. Thanks for the fantastic history report – the future is going to be even more exciting!!! As a 80’s kid I loved this bubble gum growing up. Now I have a son of my own in little league, and the gum is still here. One thing this country has not changed a good sport and a great CHEW. Great story. Thanks for researching it..
What would one expect to pay for vintage unopened packages from 1980-1988 with Mayer art? Looked at auction sites and nothing popped up. You have a new fan! Just came to your site after reading a story in The Buffalo News about our R-NY Representative Chris Collins giving fellow Congress-Persons a gift of Big League Chew along with his Birthday Greetings to them. Just another way the product is being used to foster connections with a healthy and fun activity! After Googling “Big League Chew” I have come to appreciate how this little product is doing it’s part to better our world! Thanks! I remember the Plug. “Wretched” goes a bit too far, but is the first word that comes to mind. Thanks for sharing. I never had Big League Chew myself, but I loved those commercials. On a technical level, I appreciate the artwork done for the packaging (I’m an illustrator too). So Bill Mayer did that in pencils and watercolor…I should have guessed. I just saw a documentary on the Portland Mavericks called The Battered Bastards of Baseball on Netflix. Wow what an amazing story and led me to here – another great story! Been intetested in the history of candy since I stumbled upon the book The Emperors of Chocolate years ago. This blog post was similarly entertaining and informative. Great job. Look forward to reading your other posts.